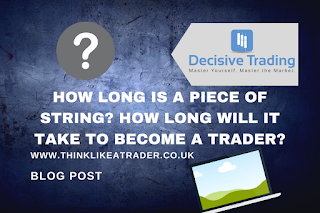 Decisive Trading: How Long is a Piece Of String? How Long Will it Take to Become a Trader? How Long is a Piece Of String? How Long Will it Take to Become a Trader? This blog post is in relation to an email I received today. The post itself isn’t aimed at that person, but it brought up a good question that doesn’t have a definite answer. I have touched on this before in blog posts, but it is one of the most common things I get asked and it also leads to a lot of people despairing and beating themselves up. The answer, really, is to ask – How long is a piece of string? What an enjoyable, leisurely stroll through life this trading lark is, right? I don’t mean to put a negative spin on trading. I always lean towards the ‘harsh’ in the blog posts/videos, because I want people to understand that this is a difficult industry. There are enough people out there already promising riches and fast cash. They are, at best, idiots. And at worst, liars. You absolutely MUST come to trading with your eyes peeled wide open if you hope to stand a chance of success. If not, that truck will keep running you over and taking your credit card details at the same time. So, let’s start looking at this string. Did I mention it was on fire? The problem with asking ‘how long’, is that you need to make the leap of faith that you ARE going to make it and will be sitting at your desk 10 years down the line, a seasoned full-time trader with a coffee beside you and your ‘work clothes’ no more than your pyjamas. But that isn’t the case. For a very large portion of people – estimates range between 80% and 90% - they will not make it. That is the failure rate of retail traders. Either they give up or lose their account and can no longer trade. It doesn’t matter if you go it alone. It doesn’t matter if you spend £300 on Zone Trader. It doesn’t matter if you spend £2,000 or £10,000 on a training course (and yes, there are plenty out there who will charge as much). So, there can be no answer to ‘how long’, because there is no way to determine if you will get there at all. However, there are things we can look at. You need to stop thinking about a training course as the holy grail. The human mind has a tendency to revert back to laziness. It does this because lazy uses less energy. Lazy is preferable, because it has less resistance and is easy. If purchasing a course, the tendency is to switch from ‘I really want to become a trader’ to, ‘Ok, now it is just a matter of time’. That is a big mistake. You need to keep your guard up. And I mean that sincerely. Whether you are one year into it or five. Keep that shield polished and braced right in front of you. Trading, even successful trading, is a game of inches. You will fight tooth and nail to pull yourself forward. But one slip and you can go tumbling backward down a very jagged and unforgiving mountain. A course is like an apprentice being given a toolbox full of the highest quality tools. Great. But he still needs to learn to not only use them, but use them professionally. Otherwise he is still going to produce terrible work. Look at the course as a steadying hand. It cuts through a lot of the bullsh** and helps you compound the stuff for you to focus on. It’s a roadmap, but you still need to drive it. On that note – stop looking for the ‘magic bean’. Nothing and no one is going to show you a secret indicator or setting that will suddenly turn you into a professional. That is a huge mistake so often made by traders. There isn’t a sudden ‘click’ as a beginner switches to a pro. Again, it is a long slog where you not only learn how to do it, but also retrain your mind. Do you honestly think if there was an indicator or bot that could do it for £100 or £2,000 the banks would be spending hundreds of millions per year on trading algorithms and automated systems that are CONSTANTLY monitored and updated? So, how long? It is the question on your mind. It is how we work. We DO look to measure the string. It depends on the individual. But a ‘safe’ bet is to say it will take you at least one year of learning before you can be considered anything nearing ‘competent’. And I am not talking about 1 year since you figured out what ‘bearish’ and ‘bullish’ means. I mean one solid year from when you start learning and putting the specific trading plan you are going to use into action on the charts. You may even make profits in this time, but I can promise you that it is in no way a representation of how your long-term experience will pan out. Quitting your job at this point would be an enormous risk and, in my opinion, a huge mistake. After that first year, that is when you ‘know’ your trading plan and how to implement it correctly. So… easy from there, right? Nope. Remember that truck? Well, here it comes again. Your trading plan should now be internalised, sure. But that mushy thing between your ears? That grey matter that propelled you to the top of the food chain? Well, that mass of goo has had thousands and millions of years of learning and evolving to make you who you are. Which is great, most of the time. But when it comes to trading, it is a huge hindrance. The mind wants to avoid risk and danger. It wants to keep you safe. It doesn’t understand that you need to risk and deal with uncertainty in the markets in order to gain. Basically, it is going to be your worst enemy for a good while. Mistakes will continue to happen. You will know exactly what to do and then do the exact opposite. Afterward, you won’t have any good explanation for why you messed up so badly. This will result in extended periods of anger at yourself, bouts of depression, and an overriding desire to give up. Now is usually about the time people start to fall away from trading. There is absolutely nothing wrong with that at all. It IS NOT for everyone. If it were, the success rate would be 100% instead of 10%. If you decide it is not for you, just walk away. It isn't failing, it is deciding to focus your energy on something else that suits you more. After the second year, I think one to two years is how long it takes to really understand yourself and train your mind to operate when trading. It takes that long to first make all of the mistakes, then make them a few more times, and finally start to address where you can make small improvements and changes. Too long! I'll do it faster! Sure, sure. I hear it all the time. And some DO get there faster. But, most do not. 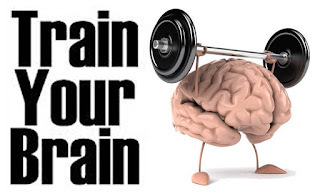 Remember - millions of years of evolution to create your brain and its operating system. A few years to wipe it down and install your new programme. In the grand scheme of things, it is still a very short timeframe. But remember, this is not a definite overview. You may take 4 years to get to the point where you are ready to start making changes and learning how to cope with the uncertainty. It could take that long before you’re willing to accept that taking every pin bar doesn’t actually work and you need to start being more disciplined. And then you come to realise that the rope you’re trying to measure… it has no fuc**ng end! It keeps going and going. Does a football player get signed by a team and then suddenly there they are, finished the journey? They continue to train every day. They work on improving every day. They also make occasional mistakes, but as a professional they are far fewer than when they were first starting out. That will be you as a trader. The consistency may appear, but you are always in danger of losing your way. If you allow that lazy brain to take over, you will slip and you will fall. It is a constant battle to maintain what you have built. But… if you have a passion for trading… it is also one of the best journeys you can take. As always, I hope that was helpful! Awesome read and bang on the money. I think the expectations people have when they come to trading is what really puts them on the back foot. I know I thought I'd be sat in my PJs making money for fun after learning for 12 months! Then 18 months pass and you start asking "why on earth aren't I consistent yet!?" and start putting pressure on yourself to correct it. Then it just turns into a viscous circle of making mistakes and getting disappointed at how long it's taking you to master this trading lark. Thanks Luke. I think we all come with that belief, no matter what we hear! It then just comes down to how quickly you realise you're wrong. It can get very expensive if you keep trying to do it fast!